I’ve been wanting to knit Lizard Ridge ever since it first went up on Knitty. It’s a wonderful, seductive pattern, don’t you think? This is the picture that accompanies the pattern. 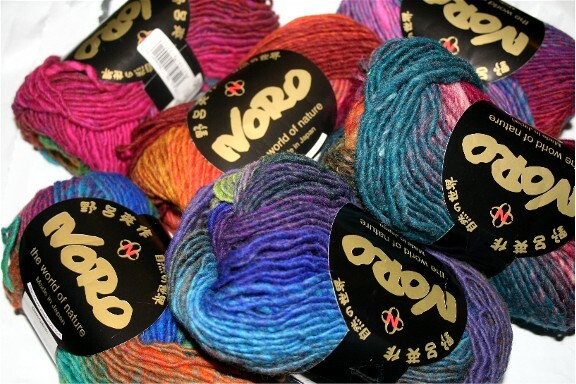 I really hesitate to buy that much expensive yarn for something that’s just for me, but I really wanted to make it in brightly colored Noro, just like in the picture. My very sweet Brother & Sister in Law (the parents of the very beautiful Miss Harper, my favorite niece) sent me a gift certificate to a yarn store for my birthday. Not only did this place them in the category of most favored relatives, it gave me the perfect opportunity to finally start in on Lizard Ridge. One of the cool things about the pattern is that you can buy the skeins as you go. So I got the first six skeins. Aren’t they wonderful? I’ve got to hunt around for needles — the size 8’s called for are, predictably, one of the few sizes I don’t think I have, although I’ve learned it’s always best to sort around through my various needle cases before being too sure about that. As soon as I get the needles straightened out, I’m going to get started on this. I’ve also decided, at long last, and with the help of some really nice posters on the Knitty Forums, to make a custom fit raglan sweater for Teddy before he goes off to school in New England this fall. The yarn is a yummy bulky merino that I dyed earlier this summer. It has been waiting around for just the right pattern — something simple to show off the soft color transitions. I think this one will be just perfect. I’ve also had a completely irresistible request for knitting. Miss Ellie eased on over while I was petting my new skeins of Noro. "Mama" she asked in a sweet voice that would melt butter, "Mama, could you knit my clothes for this fall? Can you make me more socks and some sweater and makes some pants to match?" She’s impossible to resist. She knows my weaknesses. She even, if one believes an eight year old capable of such guile, was wearing the Oh Jan dress when she made her request. School starts in four weeks. I had better get busy! ← The countdown is ….. ON! Gorgeous Joyce. I can’t wait to see yours when it’s done. You are a knitting machine! I literally learned how to knit today. And now I totally want to learn how to do that gorgeous afghan!! I have to show that to my daughter (who also learned today). GORGEOUS. Good luck and enjoy–I can’t wait to see your progress! Can’t wait to see it finished!! It’s going to be beautiful! 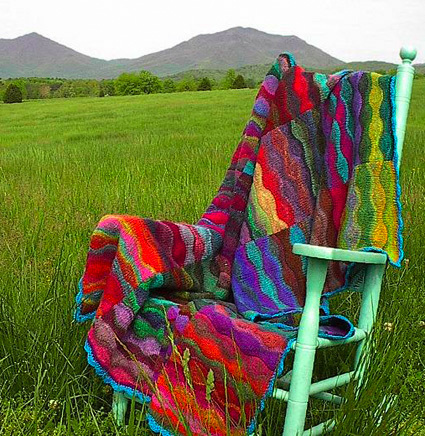 Oh Oh Oh….this afghan is gorgeous. I love Noro yarn. You won’t want to stop knitting with it. You are truly amazing with all the knitting you get done. Where do I sign up with my wish list!? Mmmm…is that your Living in Wales colorway? Love that one.